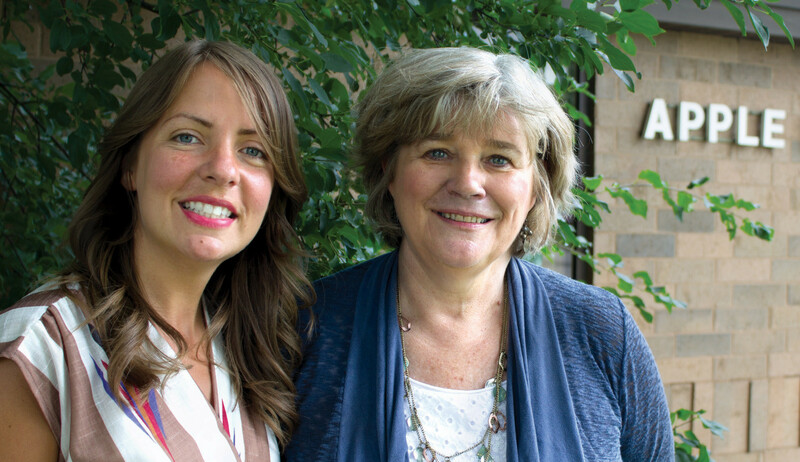 Apple Pregnancy Center Executive Director Melinda Gardner (right), created a welcoming environment for Katie Stelter (left) during her second pregnancy, which allowed her to heal and open her heart to new life. Some stories simply have to be shared, and sometimes the timing is just right. October is Respect Life Month and we find ourselves in the Jubilee Year of Mercy. Katie Stelter’s story is dramatically interwoven with both themes—the preciousness of life and the abundance of God’s mercy. Katie was born into a loving family in 1984, the second of three sisters. Katie remembers a lot of time spent together, especially in summer at their little cabin on Lake Eau Claire. The Stelters were Lutheran and they attended church regularly and enrolled the children in Sunday school. All flowed happily along, at least until the eighth grade, when Katie met and fell for a boy. He was not someone her parents approved of, she recalled, “So I started sneaking around and lying to them.” The relationship persisted, and in her junior year of high school, Katie found out she was pregnant. Katie and her son Skyler love visiting the Pregnancy Care Center and she knows that their support didn’t end after she had Skyler. support her no matter what. But her boyfriend was another story. He went into denial, refusing to believe the baby could be his. Their relationship came to an end, and Katie’s discouragement at his reaction was compounded when she overheard her parents discussing the possible need to sell the family cabin in order to support Katie and her baby. Katie’s parents had never encouraged her to choose abortion, but now that she had expressed that choice, they thought the loving thing to do was to support it. They did not foresee the consequences of Katie’s tragic decision. Like so many young women under intense pressure, neither did she. Katie had the abortion in late March of 2001, setting in motion a downward spiral of depression, substance abuse, excessive body piercing and other self-destructive behaviors. By 2007, Katie was working as a hairstylist at the Garage Salon in Chippewa Falls when a new stylist was hired, a young Ukrainian woman by the name of Valentyna Pavsyukova. Katie was immediately struck by her presence. “She was the kindest, gentlest person I had ever met.” Valentyna was also devoutly Catholic and a recent convert. About that time, Katie learned she was pregnant once again. To face this second crisis, she decided to seek help from Apple Pregnancy Care Center in Eau Claire, where she met with the executive director, Melinda Gardner. Melinda spoke gently to Katie, not pushing her, but prompting her to think about the after-effects of whatever decision she made. was to speak of it and begin to find healing. This processing of grief and healing is a significant part of the work of APPC, one of 13 such pregnancy care centers in the Diocese of La Crosse. 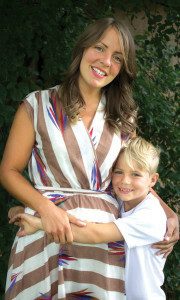 With the support of Melinda and her staff for her second pregnancy, Katie gave birth to her son Skyler on Aug. 5, 2008. Skyler is now 8 years old and is alive with fun and energy. With Valentyna’s help, Katie entered the RCIA program at Notre Dame Parish in Chippewa Falls and was confirmed at the Easter Vigil in 2009. “This was the most important day of my entire life,” she said. Through Katie’s contagious joy and prayer, her whole family has since become Catholic – including her parents, her two sisters and their husbands. A pivotal moment came when Katie’s parents called her in the midst of their journey through the RCIA process. It had been eight years since her abortion and they had never spoken of it. Her father suddenly asked, “Katie, what do we need to do to be forgiven for your abortion?” She explained to them the sacrament of reconciliation, and after that they could not wait to finish RCIA and find God’s healing forgiveness in that sacrament. Katie has spoken often in parishes and Catholic schools about her pro-life journey and her faith, connecting especially with young people. In 2013, Katie was approached by Matt Elstran, a committed pro-lifer, who wanted to tell Katie’s story through a film. The result was “Metamorphosis,” a 30-minute video that powerfully re-enacts Katie’s story through narration and flashbacks featuring Katie herself. Matt has distributed hundreds of copies of the DVD, which has been translated into six languages and can also be watched online at www.metamorphosisvideo.com. A directory of pregnancy care centers in the Diocese of La Crosse can be found by visiting www.diolc.org/respectlife. Valentyna Pavsyukova will be the speaker at this year’s Gospel of Life Celebration on Thursday, Oct. 13 at 7 p.m. at St. John the Baptist Parish in Marshfield.